My first summer trip is around the corner! 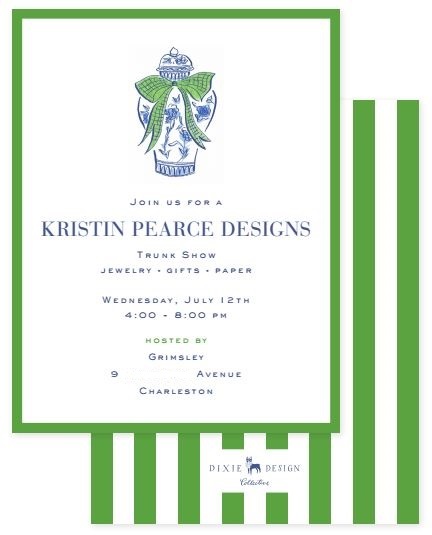 I am heading up to Charleston for a trunk show with my friend Grimsley. I haven’t been to Charleston in ages so I am so excited to visit there. My first pit stop will be at my parent’s on Amelia Island, it’s a perfect 6 hours from Miami. Leaving on July 11th, my show will be on the 12th. This invitation might be one of my favorites ever in the history of my business. I LOVE Dixie Designs and think their designs are fresh and adorable. This invitation would get me out of the house showing up to a trunk show, right? Next stop-visiting Meg at her parent’s house in North Carolina. Always a fun time there. I haven’t seen them in a month-which seems like forever. After that-heading to Atlanta to hit one of the last days of the Atlanta Gift Show. I should be able to do this on Sunday and hit the road to head to my parents house but not sure about this part of my plan. My goal is to be back in the office by Tuesday. The next trip is up North! I leave at the end of July for my week on Nantucket with my old Newport roommates. So excited to get up there. I have a couple of days in Boston before and a couple in Providence on the way back. 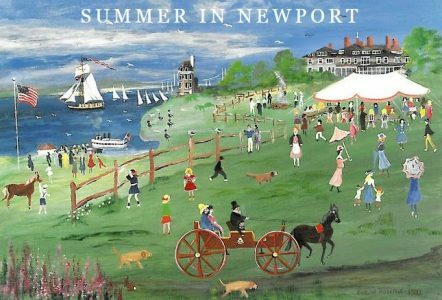 Tuesday, August 8th I will be in Newport so I can keep my blog honest and check out all my favorite Newport spots. Amidst all this planning, I still do not have a nailed down kitchen plan!! The guys I want to do my kitchen are super busy and have postponed my meeting several times. I am supposed to meet with them tomorrow so hopefully, that will work out. If I get the plans for the cabinets nailed down this week, it still realistically means there won’t be any action until September with the way things move around here. So much for “Kitchen Summer” which was what I was calling it. 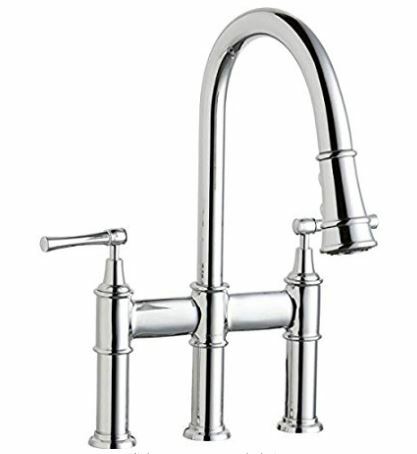 I have bought my faucet and am about to buy my sink, so that is something. My closet…oh my goodness I had so much stuff in that closet. Seriously, I found things I haven’t seen in years. I packed it all up using all my Pierre Deux duffle bags and various totes that were in there I put them in my living room. I was doing ok putting things away in the new closet when I looked for something yesterday and found two duffle bags that went unnoticed so now I have to find more room in there. Please don’t email and tell me to purge, I have been purging but there are just some things that I can’t get rid of! I have a 4 day weekend coming up this week and it will all be spent working on my apartment putting things away and clearing things out. No solid plans for the 4th of July yet…I used to LOVE that holiday. Every year I would buy a new outfit to go watch fireworks. Now, it is so unbelievably hot in Miami, I usually am trying to find something to wear so I don’t melt. But that is a whole other post. If you are in Charleston or have friends in Charleston that might want to come to my show, please reach out to me at summerinnewport@gmail.com for the address. It will be fun! Previous Post Finished closet..it’s a miracle!